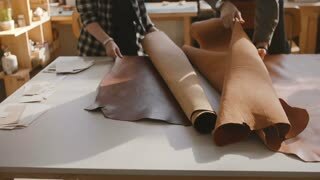 Top view of man and woman working together in a manufacturing workshop putting cut patterns on big pieces of leather. Professional skilled craftswoman preparing to cut a big piece of leather on a table in a modern manufacturing workshop. 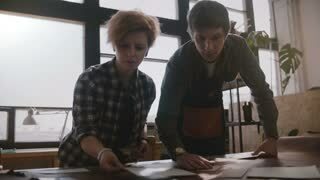 Top view lifestyle shot of man and woman working together in a manufacturing workshop with pieces of leather on a table. High angle view man and woman working together in a light manufacturing workshop with big pieces of leather on a table. Top view of artisans working together in a manufacturing workshop putting cut curves on piece of leather on a table. 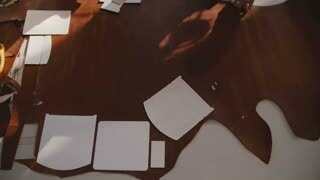 Top view of two professional artisans cooperating in a manufacturing workshop putting cut patterns on piece of leather. 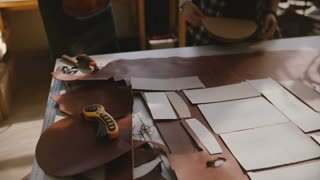 Low angle view of man and woman working together in a manufacture workshop putting cut patterns on big piece of leather.